Chances are, if you are attempting to talk to kids about math and science, you will receive a look of mild boredom at best and outright disgust at worst. Yet, if you throw in the words "video games," "robots," "lasers," or "fire," you are sure to grab their attention. Confident that learning can be a fun and engaging experience, co-founders of Los Angeles-based Two Bit Circus, Brent Bushnell and Eric Gradman, have launched a spectacle that is certain to dazzle kids and adults alike. Prepare yourselves for the STEAM Carnival, a synthesis of entertainment and education that uses cutting edge technology and showmanship to delight and inform. 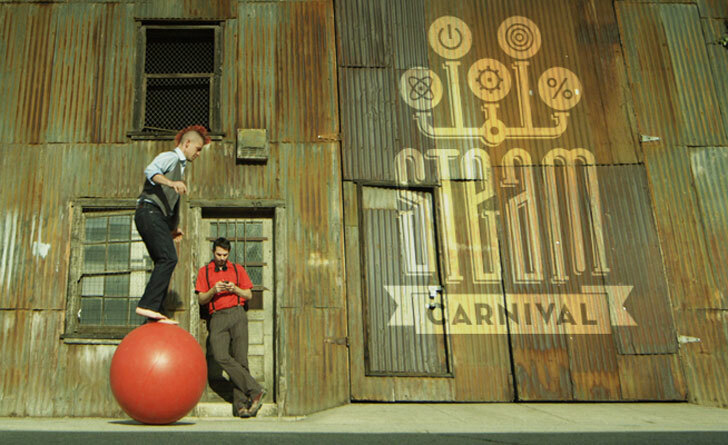 Currently the subject of a Kickstarter campaign, the STEAM Carnival is hoping to raise funds to establish a state-of-the-art big tent affair complete with games, prizes, food, live entertainment, and the latest technology to inspire children to get excited about the arts and sciences. STEAM, or “Science, Technology, Engineering, Art, and Math” seeks to encourage kids to explore the world around them and become more involved in education. According to Naval STEM, only 33% of eighth graders show an interest in the disciplines, and a scant 6% of high school seniors will seek a major in these fields. With attractions like the motion capture mechanical bull, ignition ring toss, and human asteroid games, who wouldn’t be thrilled to participate in the sciences? Through digital art galleries, musical robots, fashion shows of wearable electronics, and a healthy dose of fire, the STEAM Carnival hopes to give the world of science a much needed PR boost. Kids will also be able to sign up for a special kit that they can take home to jumpstart their careers as future inventors. Slated to open in the spring of 2014, the event will begin in Los Angeles before traveling to San Francisco and cities beyond. Two Bit Circus is working towards raising enough money via crowdsourcing to invent new activities, reach out to schools, secure locations, and finalize production. Currently the subject of a Kickstarter campaign, the STEAM Carnival is hoping to raise funds to establish a state-of-the-art big tent affair complete with games, prizes, food, live entertainment, and the latest technology to inspire children to get excited about the arts and sciences. STEAM, or "Science, Technology, Engineering, Art, and Math" seeks to encourage kids to explore the world around them and become more involved in education. According to Naval STEM, only 33% of eighth graders show an interest in the disciplines, and a scant 6% of high school seniors will seek a major in these fields. Through digital art galleries, musical robots, fashion shows of wearable electronics, and a healthy dose of fire, the STEAM Carnival hopes to give the world of science a much needed PR boost. The STEAM Carnival plans to be a huge tent affair. Slated to open in the spring of 2014, the event will begin in Los Angeles before traveling to San Francisco and cities beyond. Two Bit Circus is working towards raising enough money via crowdsourcing to invent new activities, reach out to schools, secure locations, and finalize production. Kids will also be able to sign up for a special kit that they can take home to jumpstart their careers as future inventors. With attractions like the motion capture mechanical bull, ignition ring toss, and human asteroid games, who wouldn't be thrilled to participate in the sciences?